On Monday, January 7th, Gavin Newsom was sworn into office as California’s 40th Governor. And as required by the state’s constitution, Governor Newsom released his proposed budget just a few days later on January 10th. The Governor’s proposed $209 billion budget for FY 2019-20 includes his proposed climate change investments expenditure plan, which proposes $1 billion in annual (one-time) climate investments (see below for a reminder on the funding split between annually appropriated and continuously appropriated climate investments). The proposed budget for these one-time, annual climate investments for FY 2019-2020 is down $400 million from last year. The proposed budget offers some important highlights and areas of ongoing work as CalCAN and our partners seek additional funding for Climate Smart Agriculture. 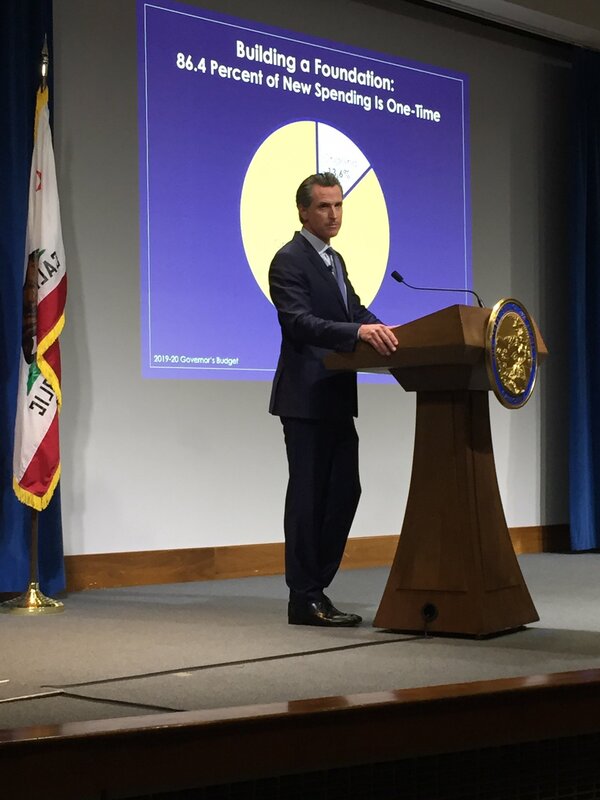 During the budget news conference, Governor Newsom specifically called out the Healthy Soils Program, saying healthy soils are “important” and an “interesting passion of mine” that he hopes the legislature will share with him. The Governor proposes $18 million for the Healthy Soils program, which is an increase over the current $15 million allocated to the program. The Governor’s budget lays out in greater detail the rationale for expanding funding for Healthy Soils, stating “Soil health also provides many other benefits, such as increased water and nutrient holding capacity, improved drought resiliency, greater microbial diversity, and increased soil structure and stability, which reduces sediment erosion into surface waters. Annual funding of $18 million was identified through a modeling tool in the development of the Natural and Working Lands Implementation Plan to achieve soil conservation practices on 500,000 acres by 2030, for a benefit of 5.3 million tons of carbon sequestration.” Click here for the budget summary, see page 125. CalCAN is thrilled to see Governor Newsom’s passion for and recognition of the importance of Healthy Soils. This represents an important moment for the program, which has seen significant highs and lows in terms of its support over the years. Nonetheless, CalCAN will be highlighting this year that the state’s recent Climate Change Implementation plan for Natural and Working Lands would actually require a $50 million annual investment in the Healthy Soils Program (including incentives, demonstration projects, technical assistance, and administration) to reach the 1 million acre target the plan outlines for healthy soils implementation. The proposed $18 million is a great start for this new administration, but only the beginning of the investments necessary to realize the significant contributions California agriculture can make to meet our climate change challenge. But not all of the Climate Smart Agriculture programs fared as well under the Governor’s budget proposal. With the exception of some funding for ongoing staffing, Governor Newsom’s budget would eliminate funding for the popular State Water Efficiency and Enhancement Program (SWEEP), which provides funding for farmers to convert to water-smart irrigation practices. This would leave farmers who are wanting to improve their water stewardship efforts in the lurch next year, after the currently available Proposition 68 funds are expended for the program. The Governor’s proposal also cuts the Dairy Methane budget, which includes funding for the Alternative Manure Management Program (AMMP) and the Dairy Digester Research and Development programs, from $99 million to $25 million. Since the program was started in 2017, dairy and livestock producer demand for AMMP has far exceeded available funding, which this year will be between $19 million and $33 million. CalCAN advocated for the creation of the SWEEP and AMMP programs and will continue to advocate for robust funding for them as the legislature takes up the budget in the coming months. What about other climate change programs? 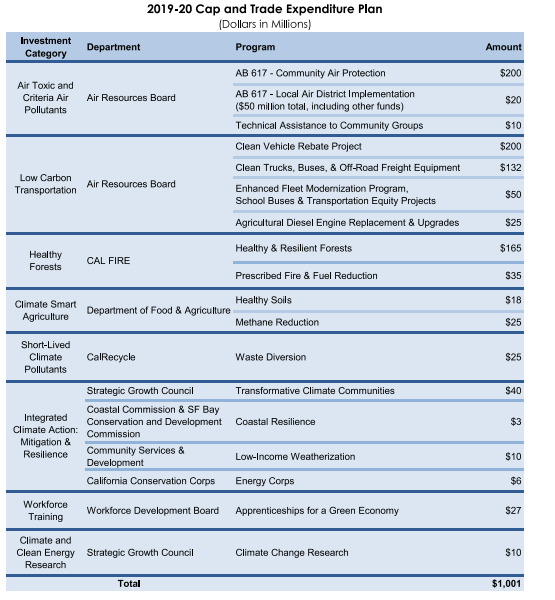 Forty percent of the cap-and-trade investment dollars are part of the state’s annual budget negotiations, as represented in the Governor’s proposal above. The remaining 60 percent of the cap-and-trade funds are continuously appropriated, meaning they are automatically funded based on statutory requirements. For example, 20 percent of the total cap-and-trade funds are continuously appropriated to the Strategic Growth Council for the Affordable Housing and Sustainable Communities (AHSC) program, of which the farmland conservation program, the Sustainable Agriculture Lands Conservation Program (SALCP), is a part. The continuously appropriated programs are not listed in the annual budget proposal. The majority of the Climate Smart Agriculture programs, including Healthy Soils, SWEEP and AMMP, are part of the annual budget process. CalCAN and our partners will continue to advocate for funding for those annually appropriated Climate Smart Agriculture programs.